Actually, what you’re smelling is a load of crappy movies. I remembered this today after buying four DVDs from the two-for-$10 bin at Walmart. One was 34 episodes of Bonanza (many of the shows from the early seasons are now in the public domain). One was Robin Hood: Men in Tights. 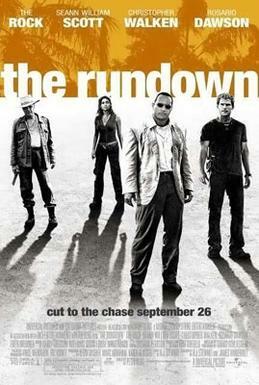 And the other two were Walking Tall and The Rundown, starring The Rock before he was Dwayne again. After watching these two films, I noticed some disturbing parallels. The first was the titular echo; “Walking” and “Run,” “Tall” and “Down.” These are semantic opposites, linguistic trickery that allows me to use the word “titular,” which doesn’t mean what I thought it did when I read it in a Jules Pfeiffer book when I was nine, but should. Presence of The Rock: Yes for both. Presence of sleazy criminal boss in control of an entire town: Yes for both (Neal McDonough in Walking Tall, Christopher Walken in The Rundown). Presence of coherent script: No for both. Fight scene with big stick: Yes for both (against a casino full of thugs in Walking Tall, against tiny Brazilian Tarzan kung-fu trapeze artists in The Rundown). Presence of bit actors from Lost: Yes for both (Michael Bowen and Kevin Durand in Walking Tall, Ben’s dad Roger Workman in The Rundown). Surprise Kevin Smith cameo: No for both. Presence of annoying sidekick: Yes for both (Johnny Knoxville in Walking Tall, Stiffler in The Rundown). Golfing scene: No for both. Presence of actor who played a Duke boy in the Dukes of Hazzard remake: Yes for both (Johnny Knoxville in Walking Tall, Stiffler in The Rundown). Oscar nominations: No for both. The conclusion is inescapable. This was all a coercion attempt, subliminal marketing and influence attempting to trick you into doing something you otherwise would never do. And we know what that is, because we paid money to see Doom. You are currently browsing the Weather Station 1 blog archives for the day Saturday, July 17th, 2010.